PUBG Corp and StarLadder expand their foray into the eSports with the launch of the first professional league for PlayerUnknown's Battlegrounds in Europe. The annual combined prize pool for the professional PUBG Europe League (PEL) and Contenders League will be €1,000,000. 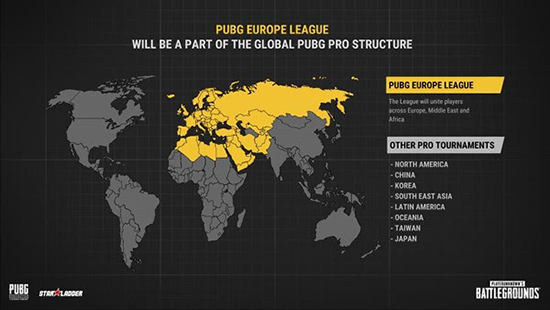 Starting in January 2019, PUBG Europe League will be part of a global competitive system, in which top-performing teams from PEL will have a chance to qualify for an international event at the end of the season, where the best teams from each region will compete against one another to decide the season’s champion. The League will consist of three phases in the 2019 season. Throughout the whole season 16 teams of PUBG Europe League will play in a specially designed Battle Royale LAN-studio in one of the European capitals. 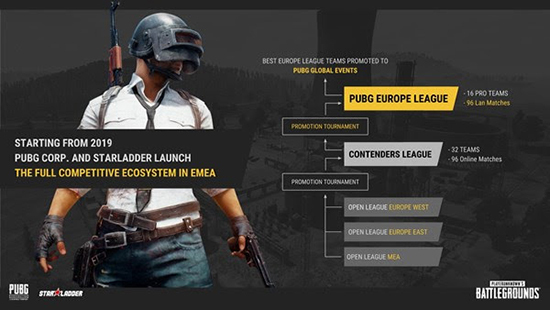 PUBG Corp. will provide housing and travel support to the teams participating at the PUBG Europe League, and continue supporting the teams with revenue share of the league. More details about the support will be announced later on. Qualifying tournaments kick-off in October and run until the middle of December culminating in the LAN event with 32 teams.